just leave them on buffel grass until they sell? Don’t know? 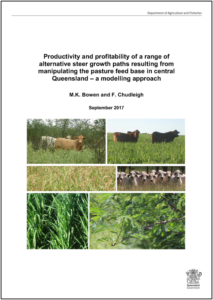 The answers are in this report ‘Productivity and profitability of a range of alternative steer growth paths resulting from manipulating the pasture feed base in central Queensland – a modelling approach’ by Maree Bowen and Fred Chudleigh, Department of Agriculture and Fisheries, Queensland (PDF, 2 MB).